I had this moment of clarity earlier last week in which I unwrapped the Aerin Spring Essentials collection and felt... how shall I put this? I felt like I was an adult. Now I know what you are thinking- at the age of 34, I probably should have felt like an adult before. But, I've found in my thirties there are moments that grab you and remind you that you aren't a kid anymore. 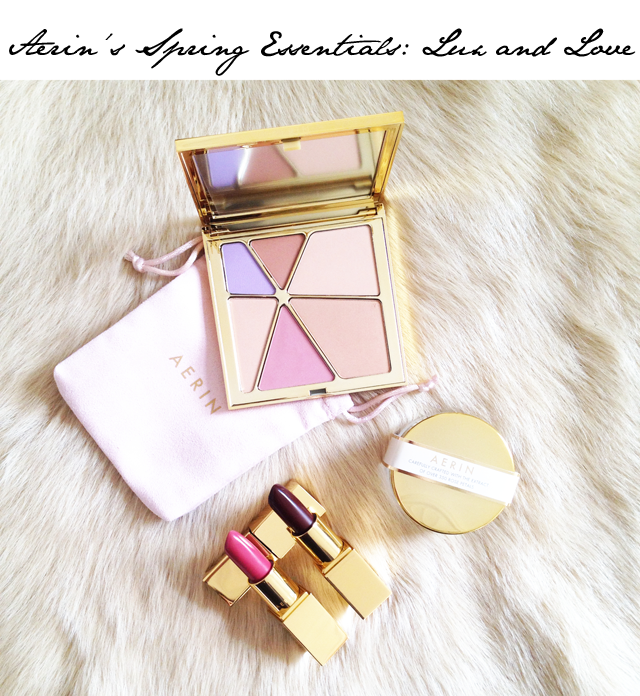 My Aerin moment stemmed from the fact that I am just starting to recognise the importance of good quality makeup. My skin isn't the type that can deal with a lot of different cheap buys anymore. Plus, there is a certain luxury that comes with investing in a $30 lipstick. Yes, Aerin's lipsticks are $30. But never before have my lips felt more nourished or more lux. Even the smell is worth the investment. Have you ever compared the smell of a great lipstick bought at a department store with that of a lipstick bought at your local drug store? It's like comparing a perfume from Britney Spears with that of Tom Ford. It's just not on the same level. Aerin Lauder is a woman I have watched from a far and respected greatly over the years. When I was younger I remember seeing her in magazines like Vogue and Town & Country and thinking that I wanted my thirties to look like hers. Well, it's perfect timing for her makeup release as that gets me one step closer. Sadly, you can't buy into the Estee Lauder family lifestyle at your local department store. I have a feeling that would require a lot more than a $30 exchange for a rose scented lipstick. But hey, I remain hopeful.